The Ultimate Guidebook For Empaths and Highly Sensitive People! 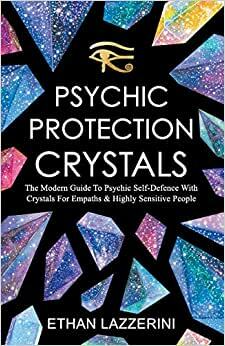 "Consider this your bible on protective crystals and how to use them. Thorough and magical, yet practical and accessible. A definite must-have for empaths and sensitive people who work with crystals. Bravo!" Start reading Psychic Protection Crystals on your Kindle in under a minute. Although no photos, in-depth explanations and diagrams give the reader all necessary information and more. A must have book ! This book tackles some pretty woo-woo stuff in a very down to earth way. A comprehensive guide full of practical tools that will help you navigate the real world challenges of being empathic. This book made an imedate impact on my life. The protocols for after care after a psychic attack were spot on and helped me get unstuck on my own personal healing path. In a world full of confusing spiritual guidance coming from other dimensions and disembodied teachers, it is so refreshing to find an author grounded in the middle realm - humbly offering his well researched advice. 5.0 out of 5 starsI Love this book! I have been waiting for this book to come out and it didn't disappoint. I now have all three of his books and they are all easy to read and understand yet not wordy just to take up space. This book as with all of his books get to the point and tell you what you want to know. It starts out with useful information and ends with information. Unlike so many books that after reading through multiple chapters of filler and everything you wanted to know is in the last chapter. I have bought multiple copies for friends that are interested in stones and just had one call last night telling me how much she loved the book and how she uses it combined with his book on grids. LOVE IT! What can I say...what an outstanding book. When I started reading it I had a lot of questions. Thats the main reason that I bought it. Once I was done reading I felt empowered & fearless. Thank you for such a wonderful masterpiece & future reference guide. This is an excellent book! Everything is laid out precisely and easily so you can take steps to protect yourself quickly. It is an invaluable tool and I actually use a lot of the information while teaching my Reiki classes. Being so sensitive to energies, it is so important to protect and this is the best information I have come across. I especially love the paperback as I can highlight the especially important information and can easily use it for reference.I recommend this book to everyone. 5.0 out of 5 starsThis is a great book! Ethan is very knowledgeable!! This is a great book! I am learning a ton about protection crystals because I am an empath I have many in my life that try to zap my energy or unload their issues on me!